This summer teacher Nick LaFave expanded his knowledge of habitats and community ecology as part of PolarTREC (Teachers and Researchers Exploring and Collaborating). The program pairs K-12 teachers with polar scientists for field research in the Polar Regions. Teachers typically spend two to six weeks working with researchers while reporting on their experience to students and community via the internet and satellite phone. LaFave spent six weeks working alongside ecologist Amanda Koltz and research assistant, Kiki Contreras (Duke University), at Toolik Field Station studying wolf spiders, the tundra’s most abundant invertebrate predator. The team is studying wolf spiders in order to better understand the ways in which the Arctic food web may change in response to a warming climate. 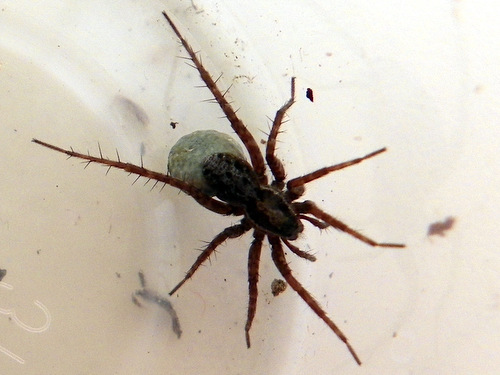 Team Spider looked at wolf spider distribution in three locations. The primary site consisted of five plots located about a 10 minute walk from Toolik. In each plot six aluminum rings, each 1.5m in diameter, were buried several inches in the tundra to corral spiders and their surrounding ecosystems. Scientists then control and change variables (like the number of spiders and the temperature by way of ring-sized open top greenhouses) in each ring and compare ecosystem changes. Each ring is outfitted with three spider pitfall traps (a plastic cup) set into the soil, a temperature sensor, and soil nutrient probes. Soil temperature and moisture are also recorded. Screens placed over top of other plastic cups allowed Team Spider to catch and catalog other critters living in the plots that are likely wolf spider prey. The team also took soil samples, referred to as “tundra cake” from their plots. Back in the Toolik field lab, soil samples were weighed and placed in large funnels in five gallon buckets with lights placed over top. Heat from the lights drove organisms downward and out into the bucket. In this way, Team Spider discovered arthropods living in the top few inches of tundra. Plots in Atigun River Gorge provide a contrast to the Toolik plots because snow melts about a month earlier than at Toolik. The team hopes to learn how a longer growing season affects wolf spider populations. Here the team laid out a 10m x 10m grid and placed a pitfall trap into the soil at every meter. Cups were collected 24 hours later and brought back to the lab and counted for total abundance, different species, females, and females with eggs. Similar experiments were also run at Imnavait Creek Research Site where snow melts a couple of weeks later than at Toolik (a shorter growing season). Now back in South Carolina at the start of a new school year, LaFave is still developing activities from nearly every research group he talked with while at Toolik to integrate into his classes. He plans to take his Advanced Placement class to visit Koltz’s lab following her visit to work with his class as they establish some ongoing monitoring projects at Clover High. “Wolf spiders really are everywhere – different species live all over North America, even South Carolina – the wolf spider is the South Carolina state spider! So, it will be fun to recreate our Toolik field study here at Clover High,” says LaFave.